If only someone would get Godzilla a Snickers, so much urban destruction could be averted. A new spot for the candy bar brand applies its "You're not you when you're hungry" tagline to the famous Japanese monster, who will return to U.S. theaters this May. When he's not wreaking havoc on entire cities, Godzilla is in fact a monster ladies' man, ping-pong player and water skier—a consummate bro. BBDO's execution of the ad is more or less genius, complete with cheesy theme music and zippy montage. Godzilla himself is styled as an oversized action figure, more like Bobcat Goldthwait's tiny-town-wrecking incarnation in One Crazy Summer than Hollywood's city-stomping terror lizard. I suppose we should be glad the "real" Godzilla isn't such a good guy with a sweet tooth for nougat. If he were really that easy to calm him down, it wouldn't make for much of a movie. 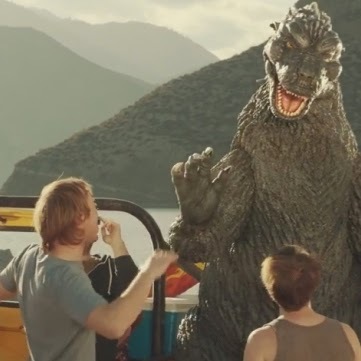 SRC: AdWeek "Godzilla Is One Hard-Partying Bro, Until He Runs Out of Snickers"